KUTZTOWN, PA – Rodale Institute, known worldwide for its organic research and education, is planning to expand, creating satellite centers across the nation. These “Regional Resource Centers” will help more farmers transition to organic operations. 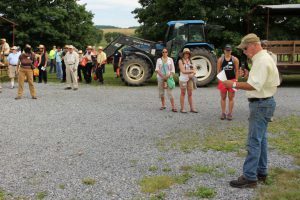 Realizing not everyone has the opportunity or the means to physically visit the 333-acre experimental farm in Kutztown, Rodale Institute aims to create “mini-Rodale Institutes.” Establishment of these centers can be even more useful than online presentations and webinars, creating a greater impact with farmers during the transition process. Boulder, Colorado, Memphis, Tennessee, eastern Michigan, and northern Montana are being looked at for the initial centers. These Regional Resource Centers are intended for regions of the country that have different climates and crops than here in the Northeast. The goal is open these centers by the end of this year. Recent reports show that the consumer demand for organic food and beverages has has greatly increased. The US organic industry, according to the Organic Trade Association (OTA), saw its largest dollar gain in 2015, adding $4.2 billion in sales. Manufacturers are having difficulties finding enough farms to supply organic ingredients. Rodale Institute is determined to change that market scenario. The ultimate goal in establishing of Rodale Regional Resource Centers will be to successfully transition farmers organic and to provide needed resources for farmers who are already organic. Note: The above was a press release from Rodale Institute.